Solar energy has become increasingly common on rooftops across USA in the past few years. Over 900,000 homes get much of their electricity from the sun. If recent researches to be believed, solar will emerge as less expensive than coal by 2020. Following this recent solar wave in the country, if you are also planning to go solar, you need to get detail idea about the different types of solar panel companies. Based on the 2017 installation report, we have listed the top 10 US solar companies in residential sector. Although, these companies install residential solar panels; they are also active in utility and commercial sector. headquartered in Houston, Texas, Sunnova was founded in 2012 and is a leading privately held US residential solar and battery storage service provider. The company has nearly 6000 customers across the US including Guam, Puerto Rico and the Northern Mariana Islands. The company provides a 25-year service commitment with every homeowner’s customized solar and storage system.279,741KW are installed by this company so far and in 2017,Sunnova installed 82,797.00KW. Founded in 1994, Trinity Solar sells, designs, installs and services custom solar electric systems for home and business owners. The company is ranked as the largest privately-held residential solar installation company in USA. The company has so far installed solar for over 33,000 homes and business. Trinity has installed 93.886KW solar panels in residential sector and in 2017, the company has installed 50,224.80KW. Located in Gilbert in Arizona, Titan Solar Power is a popular name in the field of clean renewable power. The company makes renewable energy systems easy to understand, utilize and financially accessible.Around 75,845KW were installed by this company and in 2017, this has installed nearly 46,922.10KW solar PV in residential solar sector. Established in 2009, Momentum Solar is one of the solar contractors in USA. The company is considered as the 500 fastest-growing private companies that employs over 600 people across the USA. Homeowners get end-to-end customized design, engineering, installation and financing services for their residential solar systems. Momentum Solar has installed around 55,365KW solar PV yet and in 2017, the company has successfully installed 35,365.50KW. PetersenDean was built in 1984 and now has become a household name in the area of renewable energy. With 222,000KW installed solar panels, the company qualifies them to attach a solar system to a home with distinction. In 2017, the company installed 35,341.70KW and is considered as market leader roofing and solar installations. Located in Boulder, Colorado, Namaste Solar started functioning in 2005 and is an employee-owned Public Benefit Corporation and certified B Corporation. This company designs, installs, and maintains solar panel electric systems for residential homeowners, commercial property owners, as well as utility-scale developers. Around 84,747KW were installed so far by this company and in 2017 Namaste’ has successfully installed 34,414.60KW residential solar PV in the USA. Founded by John Almond and Kelly Shawhan in 2012, Semper Solaris is one of the fastest growing licensed solar and roofing installation companies in California.operated by a team of veterans and inspired by Semper Fidelis, this is a locally owned company and is dedicated to excellence as well as extraordinary customer service through loyalty, integrity, and hard work. In 2017, the company has installed 19,370.30KW solar PV in US residences and totaled its installation to 63,370KW so far. with over 140employees servicing four US states and 11 major markets, Premier Solar Solutions is a multi-state residential commercial EPC and Installation contractor.The company has installed 80,000KW solar PV yet and in 2017, this has installed 19,073.80KW solar PV in residential sector. 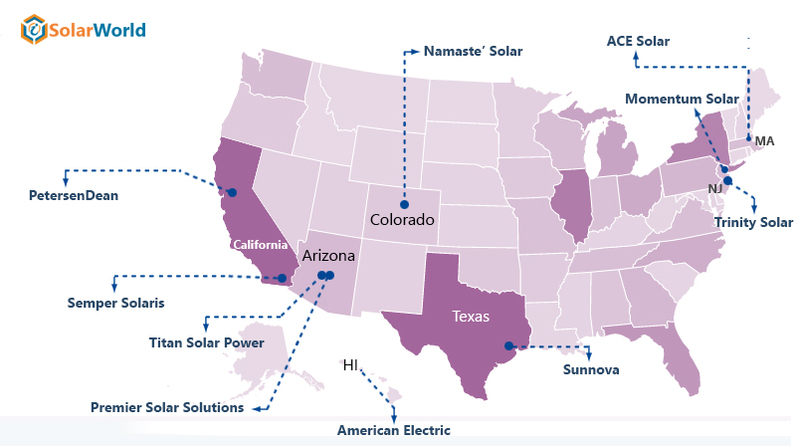 Situated in Massachusetts, ACE Solar is comprised of industry veterans. There are 27 people working within this company and together they have installed 43,080KW PV solar in residential sector yet and in 2017, ACE successfully installed 18,875.30KW. American Electric has been at the pinnacle of Hawaii’s electrical contracting and services industry since it was founded in 1946. The company has built, serviced or maintained virtually. The company has been active in various phases of electrical construction for industrial plants, petrochemical plants, power generation plants, governmental and military facilities, commercial buildings, hotels, medical facilities, co-gen systems, and industrial &commercial controls. American Electric has successfully installed 43,080KW yet. In 2017, they have installed 18,875.3KW. Interested to get more such details, subscribe to our newsletter now.